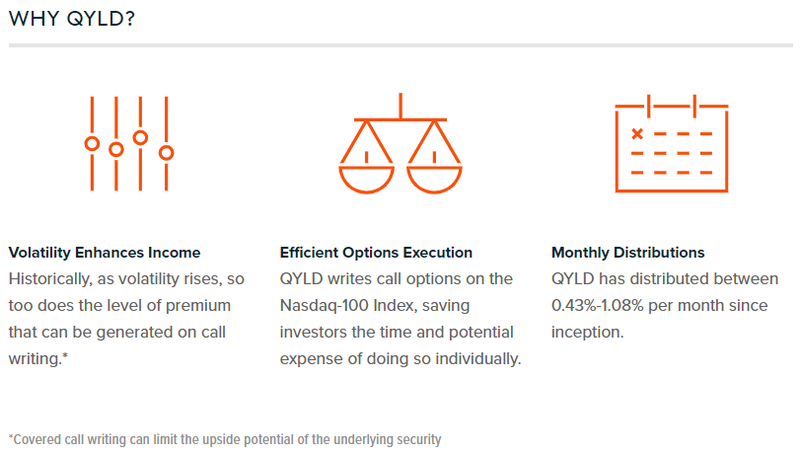 QYLD is an ETF focused on achieving total return through reduced volatility. 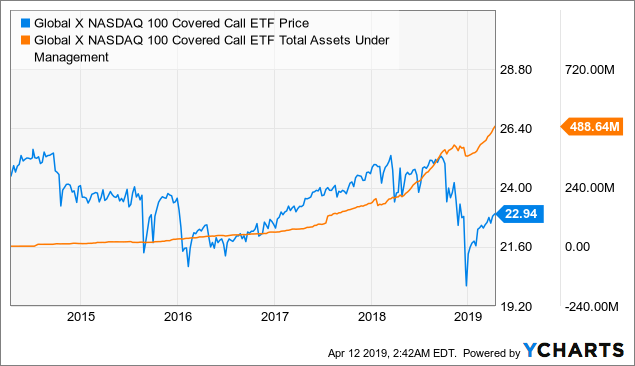 The fund follows the CBOE Nasdaq-100 BuyWrite V2 Index which writes at-the-money, 1-month call options on the NASDAQ 100. We take a deep dive into the fund and figure out if it makes sense for your portfolio. In our last article we discussed a fairly popular technology-focused closed-end fund. It sought an attractive total return while reducing income, the Nuveen NASDAQ 100 Dynamic Overwrite Fund (QQQX). The fund accomplishes that goal by employing a covered call options strategy on the underlying portfolio. By writing options, the fund generates an income stream which in turn helps lower the downside risks. One of the comparables we looked at in that article is the Global X NASDAQ 100 Covered Call ETF (QYLD). Just like QQQX, QYLD follows the NASDAQ 100 securities and invests in an unlevered portfolio. Unlike QQQX, this is an ETF which offers more transparency and slightly lower costs. If you have not done so yet, please take a look at my ETF primer, "What are Exchange Traded Funds?" Are there other benefits? Does the fund deliver? Furthermore, the last few Global X Funds we have looked at, I was left unimpressed. Will this fund be different? As typical, Global X does a pretty good job describing the investment case for the fund. As we discussed, covered calls are a great strategy for generating some extra income. Unlike with other strategies, options prices increase with both increased volatility and increased interest rates. As such, you earn additional income from the options premiums when many other investments take a hit. The fund then has two reasons to be selected. First, it uses index options versus individual calls. This provides a bit more certainty for the fund and reduces costs. Secondly, this fund provides monthly distributions. 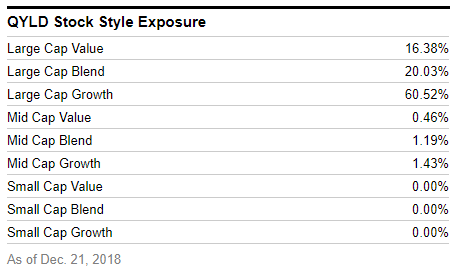 In the past I have been critical with the other Global X ETFs we have looked at because while the sponsor painted a great marketing picture, the sponsor did not go out of the way to discuss the underlying index. 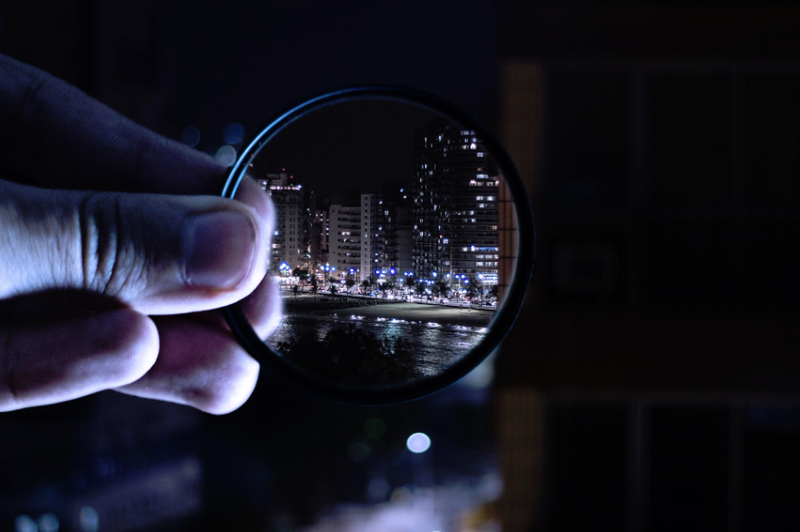 As we know, there is often a disconnect between what the sponsor promises and what the underlying index seeks to accomplish. 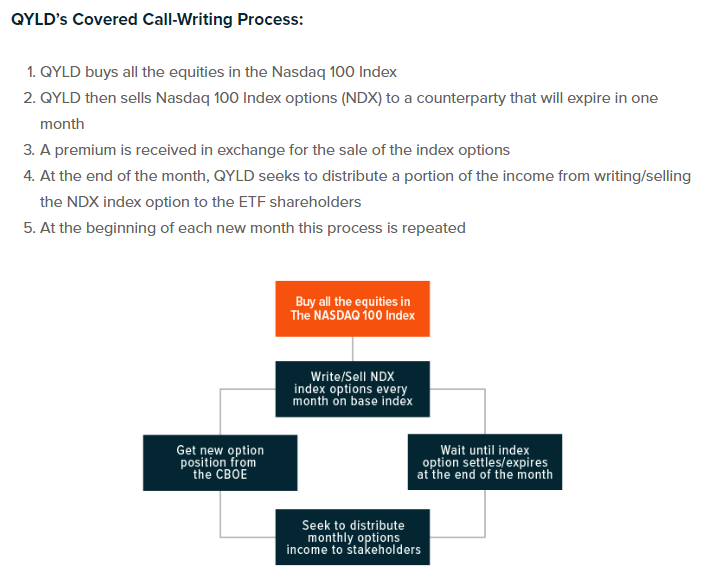 With QYLD, Global X does quite a bit better of a job discussing the underlying call writing strategy here, so I give them credit. 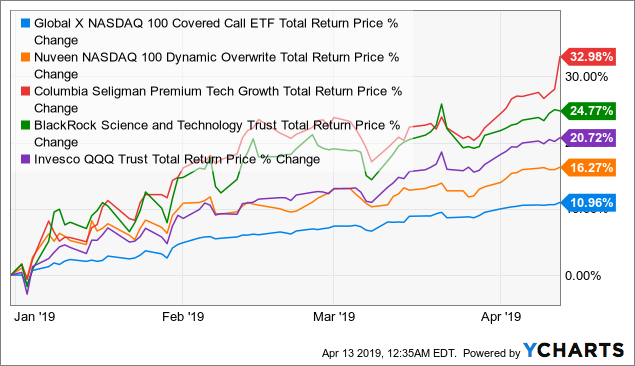 If you are interested in investing in this ETF, you can find the underlying index methodology here, and the main index page with the fact sheets, methodology, and index values here. 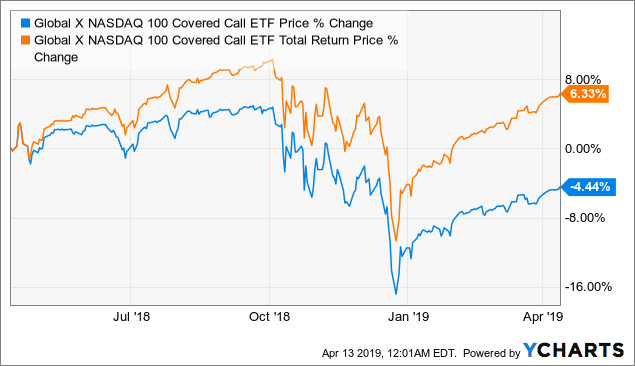 The Nasdaq 100 Covered Call ETF follows the CBOE Nasdaq-100 BuyWrite V2 Index. Even though the ETF was launched in 2013, the underlying index has been around since 1994. As discussed, the index is fairly simple. It purchases the portfolio of stocks indexed to the NASDAQ 100 and then sells 1 month, at the money call options. There was, however, a change for version 2.0 in 2015. In the new version, the index would close out the call option a day before expiration, rather than letting it expire. Unlike other index providers, CBOE does not do too good of a job making the methodology documents "investor-friendly." Global X, however, does do a better job! 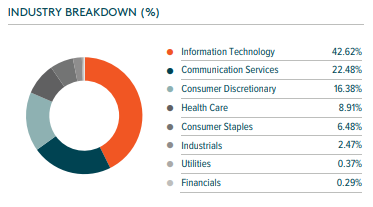 The top 10 holdings make up 56.59% of the fund and as such, is quite concentrated. Once again the vast majority of your holdings are Microsoft (MSFT), Apple (AAPL), Amazon (AMZN), Alphabet/Google (GOOG) (NASDAQ:GOOGL), Facebook (FB), Cisco (CSCO), Intel (INTC), Comcast (CMCSA), and PepsiCo (PEP). Unfortunately, for whatever reason Global X does not provide any more information on the holdings on the website. Where we do find the data is in the quarterly fact sheet. We do have a broader breakdown as of the end of 2018. As to be expected, this is a large-cap fund and as with tech, predominantly "growth" centric. Despite the price per share taking a dive in Q4 2018, the fund has been fairly successful in raising and maintaining capital. Despite many of the Global X ETFs being quite mediocre, as a sponsor, it has generally done a great job raising capital for its funds. 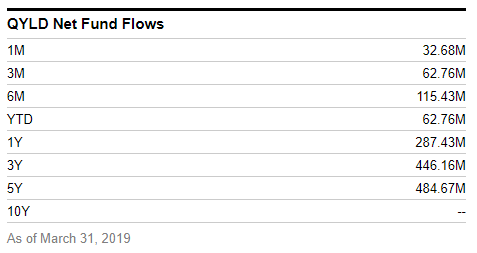 Furthermore, the fund has managed to stay on the right side of the flows since its inception! Year to date, the fund has done fairly well and has achieved a 10.96% total return. The price per share increased 7.98%. The last 12 months have been volatile of course although at the end of the day, the fund came out ahead. The fund has achieved a 6.33% total return while the price per share decreased 4.44%. Looking back three years gives us a perfect picture of how a covered call fund behaves in a flat to upwards market. Since inception, QYLD has achieved a 35.7% total return while the price per share increased 2.4%. Looking back five years we continue to see this trend play out with the fund achieving a 52.39% total return while the price per share declined 5.97%. Since inception, the fund has achieved a 52.75% total return while the underlying price per share declined 8.11%. 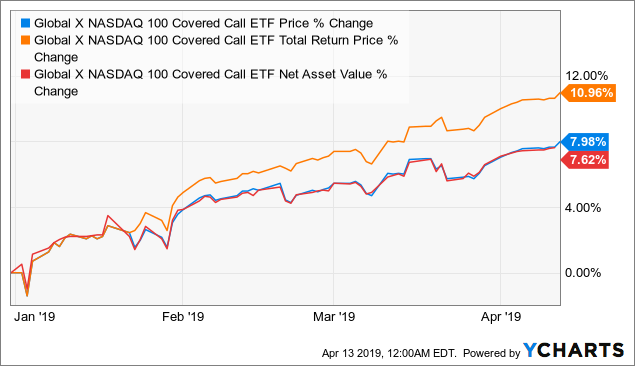 Competitor-wise, as we discussed in the Nuveen article, there are very few ETFs or CEFs that apply a covered call strategy to the NASDAQ. The most direct competitor is the Nuveen NASDAQ 100 Dynamic Overwrite closed-end fund (QQQX). 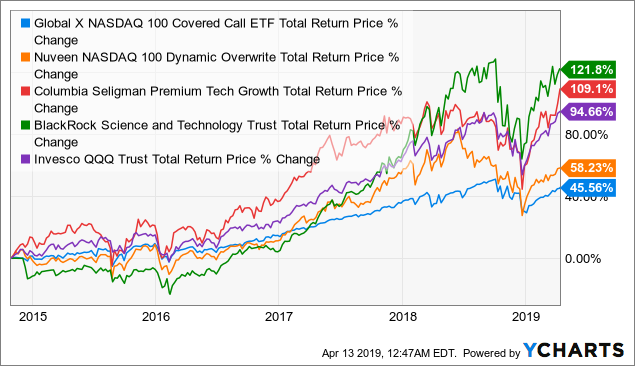 If you are okay with looking beyond the index and into the broader tech sector, then we can also include the Columbia Seligman Premium Tech Growth fund (STK) and the BlackRock Science and Technology Trust (BST). All three are unlevered and write covered calls on a portion of the portfolio. Lastly, we can also look at the NASDAQ 100 index (QQQ) itself. Year to date, we can find that all of the funds have done well, although some have done better than others. 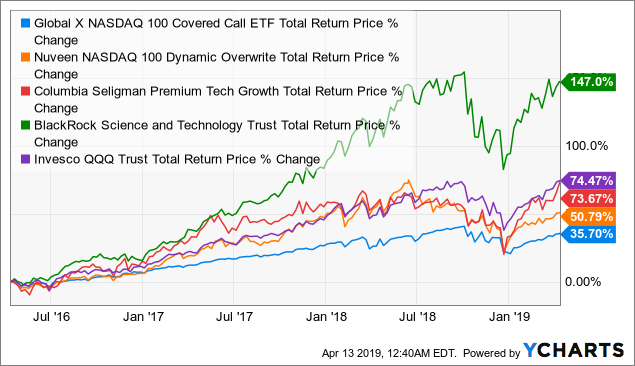 All three closed-end funds and the underlying QQQ have handily outperformed the fully covered ETF. Over the last year, we can see the story play out. The two active closed-end funds outperformed QYLD and the uncovered QQQ outperformed all. As we discussed, the Nuveen fund has had a bad 12 months primarily due to massive premium to net asset value evaporating. Going back three years we have a really interesting scenario. The Global X ETF performed exactly as expected. 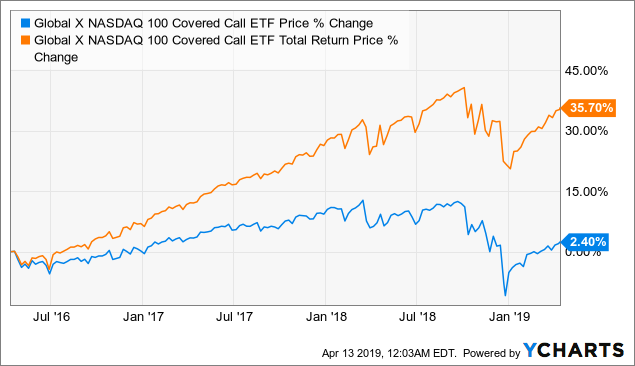 In a bull market, writing at-the-money call options would cap or prevent any upside and your total return is driven by the options premiums. In a low volatility and low interest rate environment, those options premiums also tend to be low. Most surprising perhaps is just how well the BlackRock closed-end fund performed. One driver for it was that the fund went from trading at a discount, to trading at a premium. The story is precisely the same if we go to the earliest common time period in late 2014. Overall the results are as expected! This even shows up in the risk metrics. As per YCharts, the fund had a 5-year beta of just .6221. This implies that the fund takes 62% of the risk, not to the NASDAQ, but the S&P 500! Furthermore, the fund had a maximum drawdown of 19%. If we look at the same data for the NASDAQ 100 index, we find that it has a beta of 1.155 and a maximum draw-down of 83%! Did you need a reminder of what technology investments are like? There it is! Once again, I am quite glad I looked at the fund. Despite the lagging performance against all of its peers, the fund has performed as expected! The reality is, the Global X Nasdaq 100 Covered Call ETF did precisely as its underlying index was supposed to do. The fund has certainly generated income but in a flat to rising market, the fund was absolutely ending up cutting off most capital gains. As such, the fund was outperformed by the Nuveen CEF which is also a NASDAQ 100 covered call fund. The difference is that QQQX uses active managers to determine what percentage of the portfolio options are written. Furthermore, the uncovered QQQ performed the best out of the three. 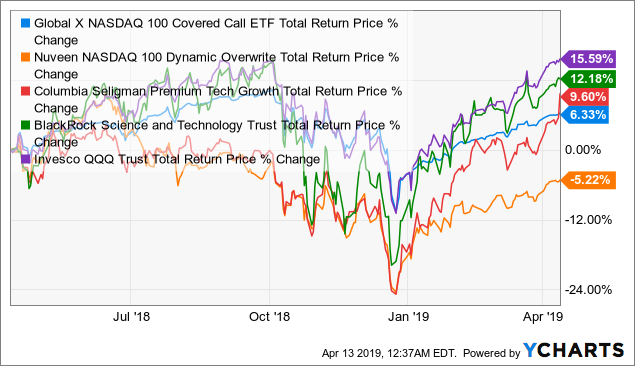 What was quite surprising, however, is that despite capping upsides, the actively managed technology-focused closed-end funds even outperformed the uncovered NASDAQ. Both the Columbia/Seligman and BlackRock funds are seriously worth considering in your due diligence process if you are considering QYLD. As we saw, over most observed time periods, active management was able to generate enough alpha to even overcome the capped gains in rising markets! 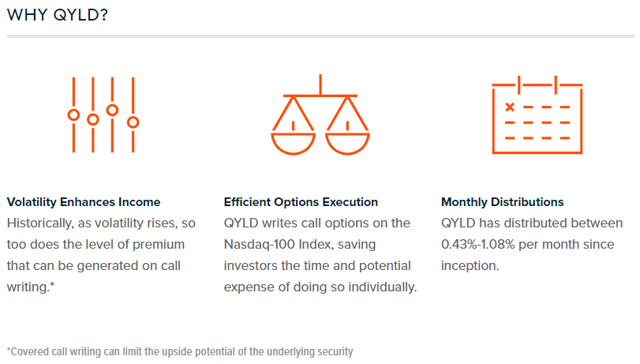 If you need high income from a fully covered NASDAQ 100 fund, QYLD is the choice. If you need to be allocated to the NASDAQ 100 but are okay with lower income, QQQX is worth considering. 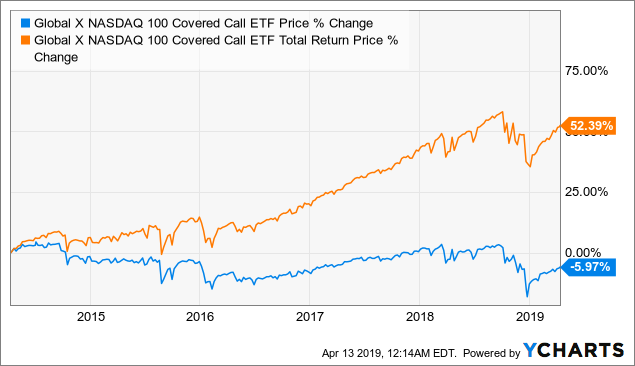 If you are not limited to the NASDAQ 100 by your investment policy statement, then take a look at the other covered call funds, starting with STK and BST. So, there you go. Thanks for reading! I hope that was helpful and look forward to your questions or comments. For more information about the Global X fund, please visit the sponsor's website here.